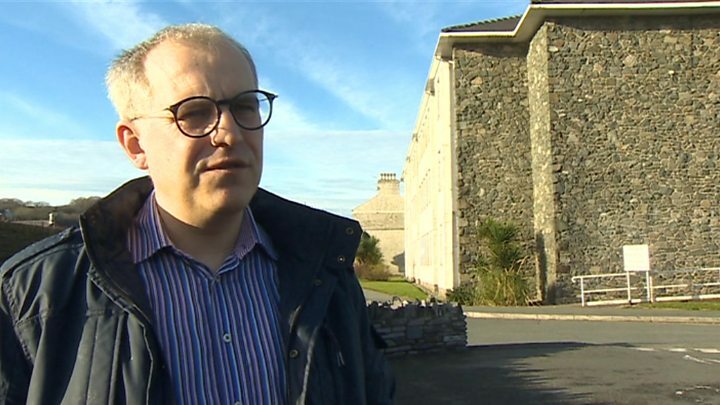 Media captionCouncillor Simon Brooks said the flow of young workers out of rural Wales was a "ridiculous situation"
A public body should be moved to Gwynedd to stem the flow of young people leaving the county, a Welsh-language campaigner has said. Simon Brooks told BBC Wales "an unintended consequence" of devolution was more public sector jobs were being centralised in the capital. Rural areas have been "losing young people by the bucket load", he added. The Welsh Government said it was "fully committed" to ensuring Gwynedd benefits from public sector jobs and investment. "I think we need to start thinking about moving public sector jobs out of Cardiff to places like Gwynedd so that people can have meaningful employment with proper careers in places like this," said Mr Brooks, a Plaid Cymru councillor in Porthmadog. "We've just lost a tax office here in Porthmadog down to Cardiff. This can't carry on. "This is an unintended consequence of devolution and I think we have to do something about it, we can't deny there is a problem, there obviously is." He added: "This is the Welsh-speaking heartland of Wales and yet we don't have a national headquarters of any Welsh-language organisations up here, they're all in Cardiff - it's a ridiculous situation." Gwynedd council leader Dyfed Edwards said the number of young people leaving the county was a "huge problem". "If we lose our young people, who are the potential leaders for our communities and society for the future, then we'll get that imbalance in the population where we know we have got an elderly population and one that's going to grow in terms of percentage over the years," he said. In total, there are almost 50 public bodies in Wales that exist at arms length from the government, such as the Children's Commissioner and Older People's Commissioner. There are nine organisations which the Welsh Government said are under its direct control. Dafydd Gruffydd works for Arloesi Gwynedd, which aims to help keep young people in rural areas. He said it can be difficult to convince young people there are local jobs. "Obviously there are challenges, there are less opportunities here than in a big city. But where we are in Parc Menai, there's a cluster of high-value digital businesses here looking for staff," he said. "And maybe one of the main challenges is to tell the world, and to tell young people in Gwynedd and Anglesey, that those opportunities do exist." Image caption Dafydd Williams believes the assumption there is no work in rural areas is one "many young people make"
Dafydd Williams completed his master's degree in London last year and returned home to Pwllheli to find a job. He now works for an online gaming developer on Parc Menai, near Bangor, which means he has an hour-long journey to and from the office every day. He thinks some young people are too willing to look for work in big towns and cities without seeing what is available locally. "I think it's an assumption I've seen some of my colleagues and friends make over the years. But the opportunities are here, they might be more difficult to look up and find, but they are definitely are here," he said. A Welsh Government spokesman said: "We are fully committed to ensuring people in Gwynedd benefit from public sector jobs and investment. "Only last month, the Economy Secretary (Ken Skates) confirmed his wish for the headquarters of the new Development Bank to be located in north Wales. "Since devolution, we have moved a significant number of Welsh Government civil service posts to north Wales. We have nearly 100 staff based in Gwynedd alone, with several hundred based in our Llandudno Junction office. "The NHS, the local authority, national park authority and other bodies in receipt of Welsh Government funding also employ a significant number of staff in Gwynedd."